The Pawpaw Plantation. Nature’s health provider. For many people in the know, a pawpaw plantation is a forest full of health benefits. We’re happy we can maximise these benefits, because here in Australia we are privileged to have one of the most pristine growing environments in the world, and that’s why we choose to use Australian grown pawpaws in our products. Combine this in the unique McArthur Pawpaw Extract™ to include up to 60% of this extract in our products, and we believe we have a highly effective range of pawpaw products on the market. Yes, we are fussy about the quality of our pawpaws. We source our fruit from flourishing plantations in North Queensland, Australia. The fruit is an ideal source for our McArthur Pawpaw Extract™ which is used in all our products. Good management of the pawpaw plantation is essential, as each pawpaw tree can only bear fruit for up to four to five years. Read about the process below we follow in creating our hand-made McArthur Skincare Complete Skincare Soap. McArthur Skincare’s Complete Skincare Soap is handmade in our factory in Queensland. Our soap contains no sodium lauryl sulphate, parabens or propylene glycol. Our soap goes through the saponification process by adding the correct proportions of olive oil, vegetable oil and lye to enable us to incorporate 20% of our unique McArthur Pawpaw Extract™ and lavender oil into this soap blend. The soap blend is then poured into moulds and is left to cool to finish the saponification process. Once the soap has completely cooled and is solid, it is removed from the moulds and left to dry and cure for approximately eight weeks on drying racks. All stages of our soap making process are carefully monitored. 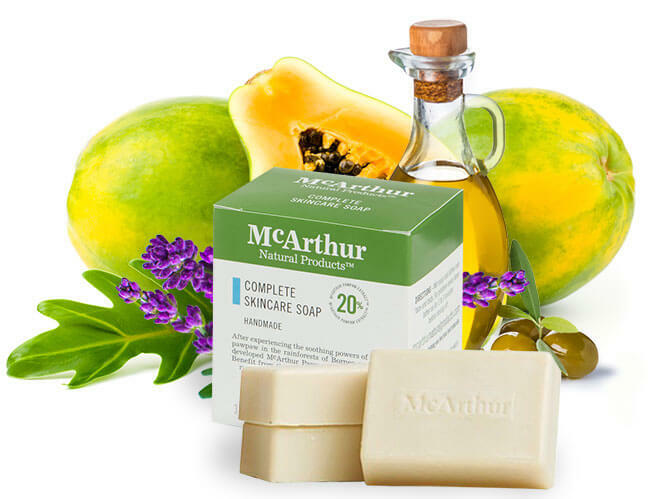 The high concentration of McArthur Pawpaw Extract™ and natural oils combines to make our handmade soap long lasting, effective at cleansing, exfoliating and luxuriously moisturising.